Speedgrow® Green is a truly natural product derived from basalts (alkaline effusive rock/volcanic rock). Its fibres are formed using a special manufacturing process whereby the rock is heated and spun.Then fibers are “glued” together with eco-friendly glue. This socalled ECOSE® technology is a new revolutionary and formaldehyde-free binding-agent technology based on a binding agent derived from natural organic base materials. It is a sustainable processing technology that is particularly environmentally friendly, enables the desired structure to develop and delivers a product with healthy constituents. The roots thereby do not encounter any resistance when growing and so become more resistant against illnesses and pests. 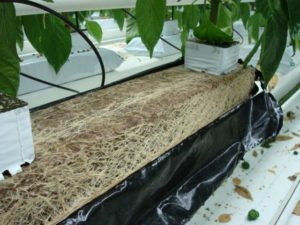 In doing so, the plants can grow bigger and stronger and rooting develops faster. The only with organic binder. Contact our dealers worldwide for more information.